John F. Kennedy was the 35th President of the United States of America, the symbolic leader of the country. His presidency began in 1961 and ended with his assignation in 1963. He was 43 years old when he first began his term of office on January 20,1961. John Fitzgerald Kennedy was named after his maternal grandfather 'John Fitzgerald'. He was called Jack by his family and friends. He had a variety of nicknames including JFK, his most prominent nickname reflecting the initials of his full name. The Secret Service code name for JFK was "The Boss." The King of Camelot was a reference to his idealistic view of the future and his similar aspirations to those of King Arthur and his castle in Camelot. "Camelot" remains a potent image for the Kennedy administration. The picture of John F. Kennedy portrays an interesting image of what this famous man looked like. The picture shows the clothing and the hairstyle that was fashionable during his presidency. He is described as an imposing figure, being 6 feet in height and 173 pounds in weight. He had blue colored eyes and thick, abundant red-brown hair. JFK was an extremely handsome man with a healthy looking bronzed complexion. His face would light up with his sparkling white, engaging smile. He possessed the ability to mix well with people of all classes - he liked people and people liked Jack. He was aware of his public image and was always well dressed in expensive, fashionable clothes. Character and Personality Traits: What was John F. Kennedy like? The personality of John F. Kennedy is described as charming, witty, gallant and gregarious. Highly competitive, forceful and extremely ambitious, he was raised in a wealthy privileged family and was destined to enter politics. He was a sensitive man and had a temper that he had the ability to control. John Kennedy had great charisma, that indefinable quality that made him well respected by people. His wit, charm and handsome good looks resulted in various extra-marital affairs. He was a visionary and determined to lead his country to great heights. He was criticized for his controlling ways and for using people and then dropping them. JFK made powerful enemies. He made the rules and often ignored convention - it was no accident that he was nicknamed "The Boss". The important role and duties of the President of the United States of America include those of Chief of State, Chief Diplomat, Chief Executive, Commander in Chief, Legislative Leader and Leader of his own political party. What was John F. Kennedy famous for? Why was John F. Kennedy important? 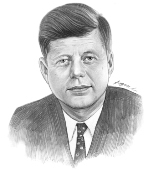 The history and life of President John F. Kennedy during his presidency is conveyed in the following fact file in an easy question and answer format. He was the 35th President of the United States of America. The dates of his presidency began in 1961 and ended in 1963 (January 20, 1961 to November 22, 1963). What other political offices did John F. Kennedy hold before his presidency? What was John F. Kennedy' nickname? His most famous nickname was "JFK"
Who was John F. Kennedy' s first lady? John F. Kennedy was famous for the events and accomplishments of his presidency, but what are the facts about the man and his private life. Facts and information about the private life of John F. Kennedy can be found in the following fact file in an easy question and answer format. When and where was John F. Kennedy born? Where was John F. Kennedy educated and what was his religion? What did John F. Kennedy do before he became President of the United States? Who was John F. Kennedy' wife and when did they marry? Did they have kids? We hope that the picture, facts and information on President John F. Kennedy will prove helpful to kids, school children and schools learning about the presidency of this famous American leader. The facts about John F Kennedy provides an overview of the President's character and personality traits. Watch the video and learn more about the major events of his life and his accomplishments. The following John F Kennedy video is a useful educational resource for kids, children and schools learning about the life of the US President John F Kennedy.